Being stuck indoors with nothing but a blocked up nose for company is miserable. So Olbas Oil to the rescue. Just a few drops on a handkerchief is all it takes to fill a room with powerful Olbas vapours - perfect for nighttime relief and sweet dreams. 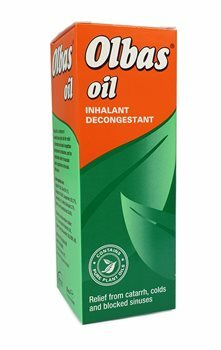 Olbas Oil is a mixture of essential pure plant oils for relief of bronchial and nasal congestion and hayfever by inhalation, for pain by application to the skin. Cajuput Oil 18.5%, Clove Oil 0.1%, Eucalyptus Oil 35,45%, Juniperberry Oil 2.7%, Levomenthol 4.1%, Methyl Salicylate 3.7%, Mint Oil, Partly Dementholised 35.45%. Children aged 3 months to 2 years, add a drop to a tissue and hold close to nose allowing child to breathe in vapours. Adults and children over 2 years, add 2 to 3 drops to a tissue and inhale vapours. Adults and children aged 12 and over, massage into the painful area 3 times a day. Can be used at night or added to hot water. Not recommended for babies under 3 months old. Since I was not able to buy this in Holland I was happy to find the H&S site to order this. Took 6 so I safed on postage all together and handed 5 over to the kids.They started using it right away, since all of them have clocked noses with this too long winter weather...Everybody happy! Quick service topped all this, thank you very much! I have used Olbas Oil for as long as I can remember.It is not available in the USA and I used to have my Mom send it to me from the UK. I add a few drops to my bath or around my shower most days.Clears the sinus -Living in California allergies are here all year round . When I have a cold or migraine I put a few drops on my tissue and it really helps,The is no other essential oil that I can find that does this job so well. I am a Pharmacist and if this was available I would recommend it frequently as no side effects as it is not ingested.Excellent value for money! The oil I get in the States comes in a blue bottle ,I was sooo happy to get the same as when I was home in England , I would like to find elastraplast on a meter. I will keep you in my address, you made me a happy camper.THANKS. Thank you very much for the quickly delivery !!! Already after a few days I received my order! I'll definately will be buying from Health Stuff again! Nothing helps you more then Olbas Oil whenever you have a flu and a closed nose. Just a couple of drops in a napkin and you'll start breathing with your nose again!